RECIPE TITLE Marinated Baby Artichokes with Lemon Aioli"
At the Governors Ball, Wolfgang likes to include some dishes in the mix that showcase fresh, locally grown ingredients. In 2006, he featured the season's first tender baby artichokes in this simple presentation: they're roasted, dressed with a shallot vinaigrette, and drizzled with a light, lemony aioli. "This is a great party dish," says Wolfgang, "because you can make everything ahead of time and put it all together at the last minute." Preheat the oven to 350°F. In a large ovenproof sauté pan, combine the carrot, onion, and olive oil over medium heat and sweat the vegetables for about 5 minutes, or until tender. Add the artichokes, pour in the wine, and deglaze the pan, scraping up any browned bits from the pan bottom. Add the thyme and bay leaf and put the pan in the oven. Roast for 20 to 30 minutes, or until the artichokes are tender when pierced with a knife. Remove the artichokes from the liquid and discard the remaining contents of the pan. Let the artichokes cool to room temperature. Season with salt and pepper. To make the lemon aioli, in a bowl, combine the mayonnaise, lemon juice, lemon zest, sugar, and salt to taste and whisk until thoroughly combined. Set aside. To make the vinaigrette, in a bowl large enough to hold the artichokes, stir together the shallot, parsley, and vinegar. Whisking constantly, slowly add the olive oil. Add the cooled artichokes to the vinaigrette and toss to coat evenly. To serve, divide the artichokes among individual plates. Drizzle with the lemon aioli and serve immediately. Wolfgang Puck's Pizza, Pasta, and More Since the 1982 opening of his L.A. restaurant Spago, Wolfgang Puck has become a household name. 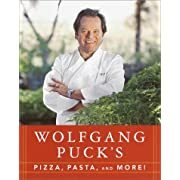 Several restaurants, TV appearances, and cookbooks later, Puck has put together Wolfgang Puck's Pizza, Pasta, and More, a collection of his favorite and most popular recipes. "Eating with family and friends is like having a little party," says Puck. "It is pure pleasure, a relaxing and fun experience. Casual and easy to prepare, these are dishes everyone can make and enjoy." Puck starts with the basics--stocks, sauces, dressings, and condiments. With chicken or vegetable stock fresh made or stored in your freezer, you have the base for Hazelnut Brown Butter and Herb Sauce (toss with wild-mushroom ravioli and dust with Parmesan) or Tomato Garlic Basil Sauce (good for pasta or pizza). The salads range from a classic Caesar with Homemade Tapenade Croutons to a Grilled Ahi Tuna Niçoise Salad to a colorful stacked Roasted Beet Napoleon. Thin-crust wood-oven pizzas are Puck's signature and he does not disappoint. The Herbed Artichoke Pizza is studded with sautéed artichoke bottoms, niçoise olives, and caramelized onions and the Tangy Chicken Pizza features peppers, eggplant, and chicken marinated in olive oil, lime, jalapeños, garlic, and cilantro. Try the brunch pizza with scrambled eggs and smoked salmon on a leisurely Sunday. The pastas are equally as enticing. Puck suggests making your own and includes his fail-safe recipe. Particularly temping are Angel Hair with Wild Mushrooms, Asparagus, and Shaved Parmesan Cheese, Crispy Calamari with Chinese Noodles and Spicy Garlic Sauce, and Gnocchi with Braised Veal Shank. He is creator of some of the world's greatest restaurants such as Spago and Postrio. He is known for the fast-growing Wolfgang Puck Express, a line of cooking accessories, television appearances on the Food Network, and a line of soups and pizzas. He is author of five previous cookbooks. Wolfgang Puck is one of the most visible names and faces in the food business. 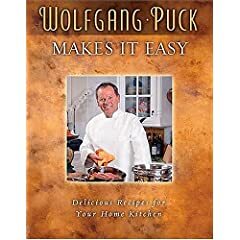 Wolfgang Puck Makes It Easy is a groundbreaking cookbook in which Wolfgang Puck shares his creativity and genius so that anyone can prepare these wonderful recipes. Every element of the book aims to make it incredibly easy to create great food of the highest quality and creativity, as only Wolfgang Puck can do. In addition to more than 100 recipes, the book features numerous cooking tips as well as advice on how to select the freshest ingredients, how to adapt recipes to the season, using the right cookware, and menu and wine selections. 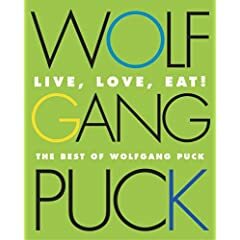 Wolfgang Puck's enthusiasm for good food could light up several small cities, and you'll find the proof on the pages of Live, Love, Eat! The Best of Wolfgang Puck. In 150 of his favorite recipes Wolfgang Puck demonstrates why and how flavorful food and fun can't be separated from each other--certainly not in his kitchen. Consider the ubiquitous guacamole recipe. Puck calls his version California Guacamole. His ingredients are few, the flavors marshaling around roasted whole garlic, which adds to the whole an underlying sweet and mellow deliciousness. It's an act of elevation and restoration for one of the grand treats of the Southwest. Puck is a master of the respectful tweaking of familiar recipes and ingredients in favor of rejuvenation and flavor. The lowly chicken comes to mind. Chicken pot pie becomes Chicken Pot Pie Soup, Puck replacing the traditional crust with delicate dumplings. With Spicy Chicken Pizza (the chicken is marinated in lime juice, olive oil, garlic, cilantro, and minced jalapeño chilies) Puck takes this Neapolitan standard on a side trip to Mexico. Viener Backhendl, Austrian fried chicken, meets Asia by way of panko, Japanese-style bread crumbs. And so on.